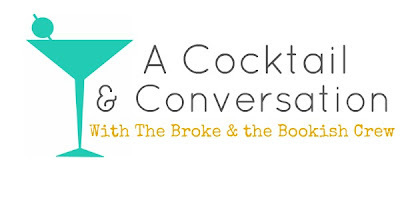 The Broke and the Bookish : A Cocktail & Conversation -- Do You Do Audiobooks? A Cocktail & Conversation -- Do You Do Audiobooks? Every other Thursday here (Friday this week because I lost track of time!!) at the Broke & The Bookish is A Cocktail Conversation time. One of the TB&TB members will pose a question to 2-3 of the other members of TB&TB crew about books, life, music, etc and then they'll answer and we can converse about it. So grab a cocktail & cozy up for some conversation. It's 5 o'clock somewhere, friends. Are you a fan of audiobooks? Why or why not? I absolutely love audio books. I would not know what to do without them. I get so much "reading" done via audio, whether it's on my commute to and from work or while I'm running. It's not only convenient, but it's a whole different way to experience a book and writing. A great narrator is key, too, and some of my favorites are Katherine Kellgren, Bahni Turpin, Nick Podehl, Moors Quirk, Jayne Entwhistle, and Kirby Heyborne, plus Bill Bryson narrating his own books are perfection. I'm sure I've forgotten a few too. Audio books are the best. The end. I love audiobooks when I'm driving because then I can still read, but I have a really hard time not getting distracted! Maybe I've just not found any AMAZING ones yet. Anyone have any recommendations for wonderful audiobooks? I enjoy audiobooks when I need them. So long car trips alone. I used to listen to them on my long commute to work but a) I replaced them with podcasts and b) I moved closer to work killing the need for them. That doesn't mean I dont enjoy them. I really like having them on car trips alone because it seems like I have company. But I am SUPER PICKY about narrators, especially if it is a series I already know. This limits which books I read in audio form. I will say that one of my frustrations is that I cant just sit and listen to a book like i could just sit and read. It seems so lazy for some reason if I am not driving or working out or something. I remember with Ready Player One I totally just laid on my couch and listened to Wil Wheaton's awesome storytelling because i wanted to find out what happened next. What about you, bookworms? Do you do audiobooks?? I occasionally borrow audiobooks from the library, but I have difficulty focusing on them and find I lose track of what's going on unless it's all I'm doing - which sort of defeats one of the benefits of audiobooks! I am not a huge fan of audio books. I get distracted and my mind starts wandering. I did just listen to the audio of To Kill A Mockingbird. I figured it would be easier with a reread and it was. I just can't do it with a new book. I've not listened to any audiobooks yet. I keep meaning to! My best friend gave me a copy of Harry Potter, The Hobbit, Lord of the Rings and the Silmarillion last year and I've still not listened to them. But to be fair I was in the middle of Honours year at university at the time so didn't have too much free time. I'll get around to them soon! I'm really picky about my audiobooks too! I never used to listen to them and then I discovered some of my favourite books had really fantastic narrators and I began listening to those. I can't listen to a new book on audio though, I either fall asleep (just because I'm relaxed not because it's boring!) or lose focus whilst I'm doing something else and then have to go back. I tend to listen to audiobooks when I can't sleep, hence the need to listen to books I know, because either I end up enjoying a re-read of a favourite book, or I'm lulled to sleep and fade in and out of the book, again not an issue because I know them so well. I definitely recommend listening to 'The Scorpio Races' by Maggie Stiefvater. The narrator for Sean is fantastic, Puck is good but shaky towards the beginning. Also 'Graceling', 'Fire' and 'Bitterblue' by Kristin Cashore, narrated by Emma Powell, who is fantastic and has such a wonderful variety of voices that she really makes it into something quite amazing to listen to. Yes, I love them! I listen when I can't read, like on my commute and on the treadmill. I do sometimes have a hard time focusing so traditionally I've stuck with YA or chick lit for audio, but I've branched out a bit (I just listened to The Bees by Laline Paull, which was fantastic literary fiction.) My favorite narrator is Rebecca Lowman, who read Rainbow Rowell's Eleanor & Park and Fangirl, and also Dark Places by Gillian Flynn, among other things. I would listen to this woman read her grocery list. Other outstanding audiobooks are the Philip Pullman's His Dark Materials series, Kiera Cass's The Selection series, and Forgive Me Leonard Peacock by Matthew Quick. Oh, and Beautiful Ruins by Jess Walter which is also adult literary fiction - not my usual audiobook fare, but incredibly well done. So, maybe this is a weird stance on it. I don't dislike audiobooks, but I get nervous when I read them? I don't like them in the car or even just sitting around, because I get distracted, and then I'm suddenly worried that I wasn't listening, and the two activities seem to constantly conflict for me. I didn't have lullabies to fall asleep to; I had audiobooks. (This was inconvenient when my sister and I still shared a room and both fell asleep at different parts.) Katherine Kellgren is wonderful, and I just finished Fuzzy Nation by John Scalzi, also narrated by Wil Wheaton, and he was fantastic. Some long-standing favorites are The Lord of the Rings and The Hobbit, but you have to get the one narrated by Rob Inglis; Flush by Carl Hiasson; Madeline L'engle narrated her Time Quartet, which is amazing; the Artemis Fowl series by Eoin Colfer; Odd Thomas by Dean Koontz. There are also some versions of Georgette Heyer's books narrated by Richard Armitage, and he does an incredible job. Hope you find some new favorites! I'm a big fan of audiobooks! I've just discovered them in the past couple of years though so my experience with them is a little limited. I can be picky with narrators, but love most of the ones I pick up. Absolutely need a distraction from traffic. Or cleaning! I adore audiobooks. I started listening to them at the gym to distract me from how much I hate running, but I then discovered they're amazing for cleaning the house (another thing I hate). I cannot just sit and listen to one though. i need to be doing other things - like commuting. When I go camping, we throw on an audiobook as we're falling asleep. It's like someone reading you to sleep. However, I am super picky about the narrators. Ender's Game is an exceptional read. As is A Certain Slant of Light by Laura Whitcomb - the narrator adds this ethereal feel to the book I don't know if it would have on paper. I find audiobooks are a great way to read translations - especially crime dramas. The reader can make something wooden on the page come to life. I've tried to do audio-books for exercising or cleaning but I find it distracting to the voice and image I've placed in my head. Specially when it's a male voice narrating female character speech or VS. For me they don't count much as actual reading as they feel more like a radio show. Reading engage me more.